Branded colouring sets make a unique and creative gift for your work colleagues and business clients. We have many colouring pencils, sketch pads and highlighter sets to help bring out the artist in anyone! Have a look through our online shop today, and discover the most suitable colouring products for you. They are the preferred promotional products for schools, galleries, creative agencies and design studios around the world. They can be relevant to your business and useful and fun for your customers. All of this means that recipients are more likely to remember your business name the next time they are on the look out for someone offering your products or services! Why not put together a creative gift set for your customers consisting of promotional pens & pencils, logo printed stylus pens and promotional highlighters to give your recipients the chance to unlock their creative potential! Art will always be an important part of life, weather it be a subject at school, or just an enjoyable hobby, colouring is one of the most used expressions of creativity. Colouring is recognized as an important step for the development in children. It is a form of communication via images which can help convey the thoughts and feelings of children; particularly when they are at an age where they might not be able to express such things in words. Drawing as a hobby is an opportunity to express one’s feelings, but also the first step when it comes to business ideas, models and briefings. When used for promotion, colouring equipment is very effective, due to its many different uses and target groups. The popularity of these creative promotional items is rising at a steady pace. Branded colouring equipment is endlessly versatile, branded with your logo and in constant use, colouring equipment can attract the attention of your target group in no time. Generally speaking: The more useful an item is, the more often its owner will use it. The more a promotional item is used, the more your company will become memorable. Branded colouring sets develop a memorable value for your brand. Deciding to use colouring equipment as advertising merchandise is clever due to its originality and memorable effect. Your branded colouring equipment can be used at pre-schools, universities, offices, private households, giving it universal appeal. When the user sees your logo or slogan across their sketch pad or crayon set, impressions are being generated, brand interest aroused and by extension, new clients created. Make the allbranded colouring sets your creative marketing ambassador. Colouring is a hobby enjoyed by many, by integrating your promotional message into the hobbies of your clients, co-workers and business partners, you’ll maximize your advertising campaign. 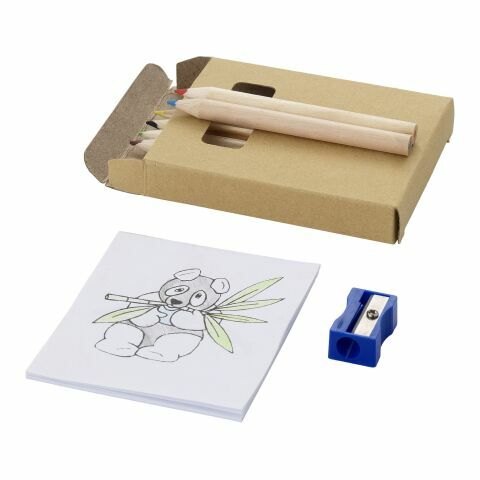 Promotional colouring items can make fantastic gifts, you can find individual colouring pens, pencil sets, crayons and sketch pads to create your own full artistic gift sets, filled with everything they need to create a masterpiece. You can use them as a small gift for the younger demographic, for occupational means in the waiting room of a surgery, or as an eye catcher at your exhibition. The multi-piece colouring sets are also suitable as original gifts for Easter and Christmas. Branded colouring sets also make excellent creative gifts to accompany PR packages for bloggers and other brand business partners. Promotional colouring sets can reach a variety of target audiences, one group that will always be targeted is children. Use promotional colouring items to impress even the little ones. Children are incredibly impressionable and will remember your brand and may become your future clients. The parents will also be exposed to your branding and will be much more immediately affected by it. You cannot go wrong by trying to reach the young and easily influenced minds of children. If your company is also relevant for children, they in turn will draw their parents’ and relatives’ attention to you. Besides colouring sets, we also have other promotional items in the allbranded online shop which targets children. We stock individual brain games, branded children’s toys as well as children’s clothing, which you can personalise by printing or embroidery for a truly personal touch. A great number of products in our colouring category are manufactured to be environmental friendly. Personalize our sustainably sourced pens - crafted from unvarnished wood, originated from controlled farming – to show the world your stance on sustainability. This can create a new and positive image of your brand, whilst helping the environment at the same time.